Before, and particularly after Mark DeMucha was interviewed on Coast to Coast AM on 17 October 2005, many fans responded with contributions via PayPal and by mail. We received a few complaints that properly addressed envelopes containing contributions were being returned by the post office. One resourceful fan (who shall remain anonymous) redirected her contribution to one of our other addresses and sent us the envelope that was IMPROPERLY rejected by the U.S. Postal Service. A black-and-white copy is attached below. The envelope is addressed PERFECTLY to the post office box that was fully paid for by the corporation. There is no possible way that the delivery of this envelope could have been attempted and the address found to be not known. Note the hand-printed "A N K" (stands for "attempted-not known") and the official postal service "RETURN TO SENDER, ATTEMPTED - NOT KNOWN" sticker. 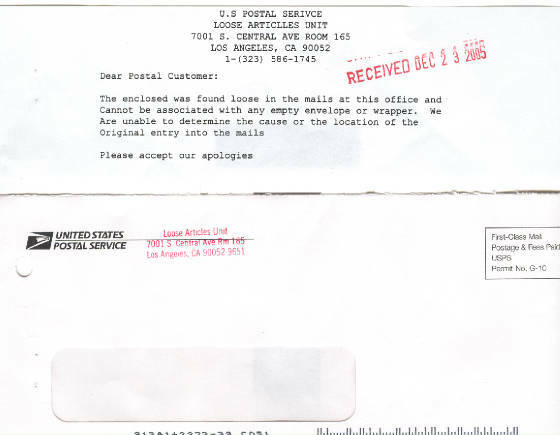 When Mark complained about this at the local post office where the box is located, he was told that the envelope was marked and returned at a different mail center or hub, not at the local office. If delivery was truly attempted, it would have been done at the post office location where the box is located. "You have your facts wrong. "Tesla invented nothing we didn't already have. "He was a threat to our system and way of life. If there is anyone honest and incorruptible in a position of authority who wishes to investigate this thinly veiled threat, we have the original email and email address available. But will anyone step forward to investigate this? As the Post Office was interfering with our mail and anonymous emailers were sending us threats, we were preparing a Private Offering for major investors who had inquired about investing in the film. In early December 2005, packets went out to several potential investors that included a return envelope to attorney Michael Finley's office. Mike uses the same type of return envelopes to send civil court papers in for filing so the court can stamp a copy with the filing date and send it back to him. 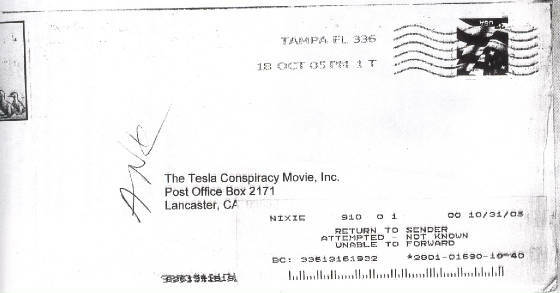 A court paper that he sent in on an entirely unrelated civil case on 2 December 2005 was stamped by the court in downtown L.A. on 8 December 2005 and placed in the mail in one of these return envelopes. This was right about the time that the Investor Packets went out. The civil court paper took a few extra weeks to arrive. It finally arrived in an official United States Postal Service Loose Articles Unit envelope with an eery note attached. The note and envelope are shown below in full color. Bottom line- SOMEONE OPENED THE RETURN ENVELOPE AND DISCARDED IT, LEAVING THE CIVIL COURT DOCUMENT BEHIND. When the document arrived, it was in perfect condition- not damaged at all, so the envelope did not get damaged in a sorting machine. If you are an investor who tried to send in an investment agreement and check, please contact us to see if your materials actually arrived. If more suspicious things happen, they will be posted on this page. Check back regularly. If it were impossible to produce free energy that is adequate to run full sized automobiles and homes, no one would need to interfere with this film. The fact that someone wants to discourage us only increases our resolve to make this information public. If you are a fan, remember that when enough people rise up against the conspirators, they will be powerless. Contribute to help get this film made! Spread the word! If 1 million people sent in an average of $15, the film would be fully financed for Production AND Distribution! Before you think that is impossible, keep in mind that hundreds of thousands of people have visited this site already. If you are an investor, remember, it is rare that providing Venture Capital is actually an Adventure!